The Eastern or Mountain Bongo (Tragelaphus eurycerus isaaci) is one of the world’s largest forest-dwelling antelope endemic to the rich Afromontane forest ecosystem in the central Kenyan highlands around Mt Kenya, the Aberdares, the Mau forest and Eburu forest. It is classified by the IUCN as critically endangered and is listed as a CITES 1 appendix antelope. Historically and presently Bongo’s population numbers are being decimated due to a proliferation of illegal and destructive activity within their natural forest reserves, ranging from logging and charcoal production to active poaching with snares and dogs. Along with many other species in the region, the mountain bongo is hunted as "bush meat" to feed a growing human population. Consequently, the growth of human settlement and agriculture has resulted in bongo habitat fragmentation, effectively isolating the remaining bongo populations on separate mountain ranges unable to interact or, importantly, interbreed. To date it is not clearly known how many individuals survive in the wild. Between 1966 and 1975, 36 founder animals were transported from Kenya to North America to begin a captive breeding program to help raise the numbers and awareness of this beautiful antelope. Despite the small number of founding stock, the ex-situ population has done extremely well, maintaining survivorship and fecundity after more than 30 years in captivity. There are now approximately 500 Eastern Bongo in captivity around the world, and these are managed under several different captive breeding programmes. 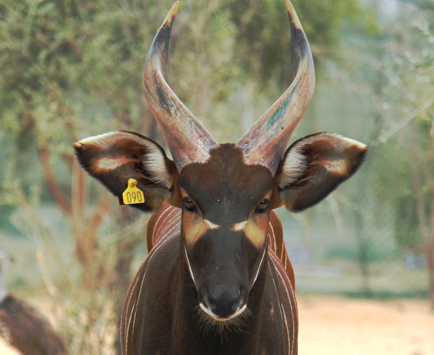 A global studbook for the bongo is managed to bring together and monitor these breeding programmes so that sound choices can be made to preserve genetic health of the captive population for the future. However, only once the genetic diversity of the remaining wild and captive bongos is known, will it be possible to supplement wild populations with captive-bred individuals and even create new breeding populations. This also depends on securing suitable, safe habitat. The work of local communities and organizations is therefore crucial to increasing our understanding of eastern bongos; their ecology and habitat requirements, the threats they face and the conservation strategies needed in order to successfully stop this beautiful and ecologically important antelope from becoming extinct in the wild. If populations in Kenya are allowed to grow through the implementation of effective conservation, including strategic transfers, the Mountain Bongo’s future can be secured in the wild. Africa’s most illusive antelope edges to extinction …….Kenya issues a global alert. The Mountain Bongo (Tragelaphus eurycerus isaaci) is on the edge of extinction mainly due to genetic factors, predation, disease and forest habitat threats. The Mountain Bongo (Tragelaphus eurycerus isaaci) existing in the wild is on the edge of extinction due mainly to forest habitat threats. It is the largest forest antelope, weighing up to 530 kg. Chestnut brown with a series of white flank stripes and long twisted horns in both males and females, the Mountain Bongo is outstandingly beautiful, but highly illusive, remaining in high altitude forest. Kenya hosts the entire global population of aproximately 100 bongos in the wild, only found in some highland forests on the east and west sides of the Great Rift Valley. Aberdare National Park and Forest Reserve is the strong hold for bongos in the country with Mau West Forest, Mount Kenya Forest and Mau Eburru Forest also containing small numbers of bongo. 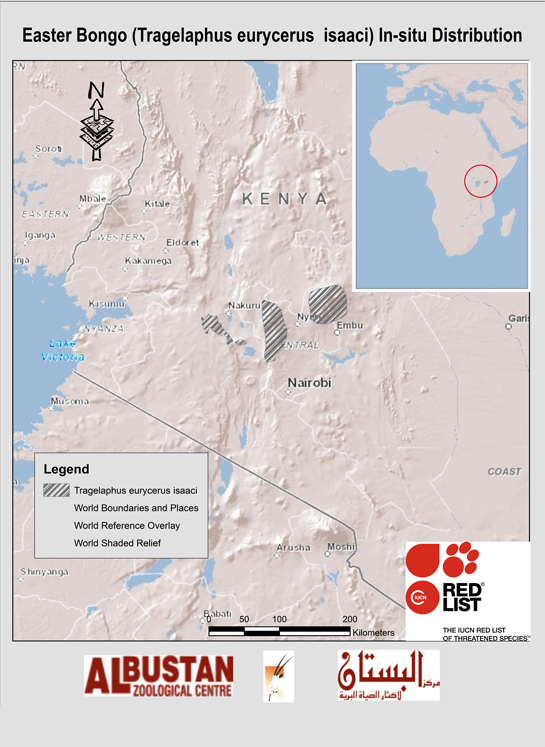 There are also another 68 individuals in a semi-captive facility on the slopes of Mount Kenya. Bongo is believed to be locally extinct in Londiani, Cherangani and Chepalungu forests. The Aberdare National Park has branded the Mountain Bongo on the park’s emblem. The Mountain Bongo is now the most threatened antelope in Kenya. A major initiative is required to accelerate the surveillance programme and to strengthen security measures in Kenya’s forest ecosystems. The situation for bongo today is as grave as it was for elephant and black rhino in the late eighties. Since then Kenya has successfully stopped the downward trend of these species - still very much threatened by well financed poachers with international links - but now stabilized. The Mountain Bongo is listed as critically endangered by the IUCN and on Appendix III of the Convention on International Trade of Endangered Species of Flora and Fauna (CITES). The international conservation community has a role to play in ensuring sufficient support for the surveillance and management processes needed both for bongo and our threatened mountain ecosystems. Bongo is a “flagship species” for indigenous forest conservation. The entire Mountain Bongo population in zoos all over the world, totaling over 500 animals is derived from wild Bongo, captured in the Aberdares in the 1970’s. The BSP is led by Mike Prettejohn and Adam Mwangi and their team of expert trackers drawn from the communities residing in areas adjacent to bongo hotspots. The BSP works closely with Kenya Forest Service (KFS) and Kenya Wildlife Service (KWS). The BSP utilise innovation and new technology such as GPS and camera traps for monitoring and mapping the Bongo hotspots, of Mt Kenya, Aberdares, Eburu and Mau Forest complex. The data forms a crucial baseline about bongo locations, habitat locations and threats. The team have most recently, discovered a new group of bongo in the Maasai Mau Forest. “This is such an exciting discovery. It is the long term protection and monitoring that is essential. It is a positive indicator with continuous monitoring as in the Aberdares, the Honi bongo group are growing in numbers. We now even have for the first time a live video recording. With support, we hope this will be possible in other areas” comments Mike Prettejohn. In July 2010 a comprehensive strategy was developed for conserving the mountain bongo. The workshop was facilitated by the IUCN and SSC Conservation Breeding Specialist Group (CBSG). One of the key objectives is to increase the effective population size of bongo in the wild through a meta-population plan linking captive and wild populations. This would promote the species’ recovery by maximising genetic diversity retention and increasing demographic security. Vital scientific data is collected from the BSP expeditions, forming a crucial baseline about bongo locations, habitat utilization and threats. The BSP also runs an effective conservation-education programme that reaches 11 schools. The outreach effort has reached over 11,000 people in communities living close to bongo habitat. The 19 Wildlife Clubs are a vital part of the Bongo Surveillance initiative and conservation programme. With the support of the teachers and the community they raise awareness about the vital resources of the Kenyan forests, rivers and unique wildlife, highlighting the importance of these resources to the livelihoods of children and their families. Projects range from income-generation farming projects, installation of solar lighting, water catchment, tree planting and visiting conservation educational centres. All bongo in captivity emanate from founder animals captured in the wild in Kenya, i.e. the Eastern Bongo (now referred to as Mountain Bongo) Tragelaphus eurycerus isaaci. The lowland or Western subspecies of bongo (T.e.eurycerus), from more central Africa, have not been part of the captive population, apart from one or two individuals which never reproduced. The first record of a bongo in captivity occurred in 1932 when a female (“Doreen”) was brought to the Bronx Zoo in New York; she lived there until 1951. As of 1936 there were also two females in London and a male and female in Rome. Until 1969 the total number of captive bongo fluctuated from 0 to 5. In 1970, a number of Kenyan imports brought the total to 6.9 (15), with bongo in Basel, Frankfurt, Washington D.C. and Milwaukee, and as wild-born captive bongo began to reproduce, the number in 1975 reached 64 animals in 21 locations. The total number of bongo eventually captured and imported to Europe and the U.S. was ~60. The captive population has continued to increase yearly, with these numbers recorded as of the end of each year: 1980 –101; 1990 – 278; 2000 – 489; 2010 – 633; and as of 2012, 677. As Mountain Bongo in the wild began to be seen less and less, the concept of reintroduction or repatriation was introduced (initially by Richard Estes and Paul Reillo of the Rare Species Conservatory Foundation), and the project reached fruition when in 2004, eighteen bongo from various U.S. zoos were returned to Kenya (to the Mt. Kenya Wildlife Conservancy) to establish a breeding herd for the release of future generations back to the wild. © 2019 Eastern Bongo. All rights reserved.